After seeing the Fleet Foxes take hold of a Milwaukee crowd earlier this year, it didn't seem like the newly formed folk-rock sect of the Sub Pop roster could possibly have anything better to offer; which was clearly a mistake. In April, on the heels of the Sun Giant EP, the Fleet Foxes took to the road with their new label-mates Blitzen Trapper, whose break-out album Wild Mountain Nation boasted a wildly uneven dividend of great songs and sound experiments, and after seeing Fleet Foxes perform that spring tour seemed an unfair pairing of a superior but inexperienced band with a more weathered and experienced band with less future promise. Though it seemed that way, it wasn't. 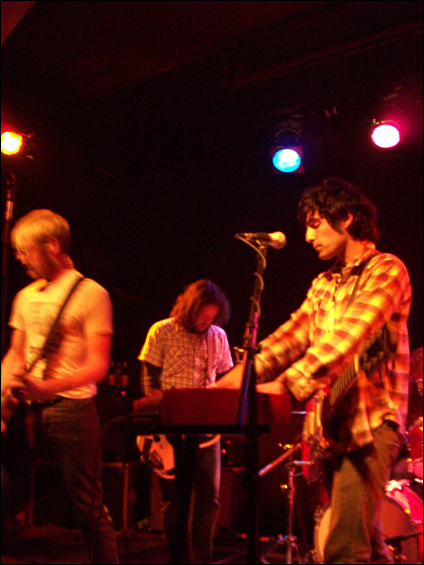 In a live setting Blitzen Trapper, however uneven their recorded work has been, is everything their proponents claim them to be. 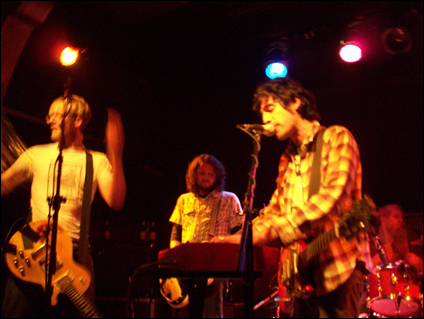 It is undoubtedly to the band's benefit that they now have two widely noticed albums under their belt to cull from, but live even Blitzen Trapper's less interesting tracks came across as damn near revelatory. Front man Eric Earley left most of the banter to his band-mates, but somehow managed to quietly command the stage, and the sold out crowd's attention, at Schubas in Chicago, the second stop on the band's current month-long tour. 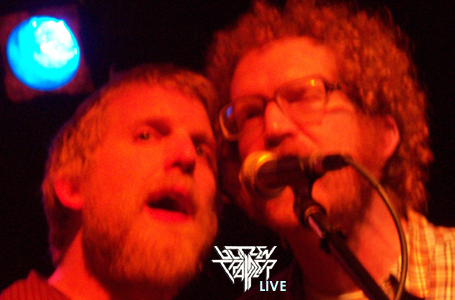 It was clear from the outset that studio renderings of "Sleepytime in the Western World" and "Fire and Fast Bullets" left a lot to be desired from their live counterparts, and across the board the band tabled some of their more wild studio concoctions as credible folk-rock (set closer "Miss Spiritual Tramp" had a more Beck-leaning sound on record; live, coupled with an incredible harmonica performance and more acoustic arrangement, it came across as rather illuminating). 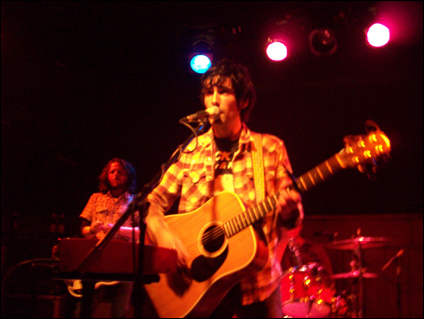 In their preview of Tuesday night's show the Chicago Reader questioned the necessity of six members in a folk rock band, but the necessity was obviously mandated by the material itself: "Black River Killer", an incredible folk-rock moment, benefitted immediately from the dual guitars and keyboard histrionics. Likewise, songs like "Saturday Night" found their folk groove fleshed out in a far more satisfactory way than their studio counter parts, with the six members bringing it in unison. Later, allowing a moment of solo clarity, on the Neil Young-ish "Not Your Lover" Earley showed the strength of his songwriting abilities. 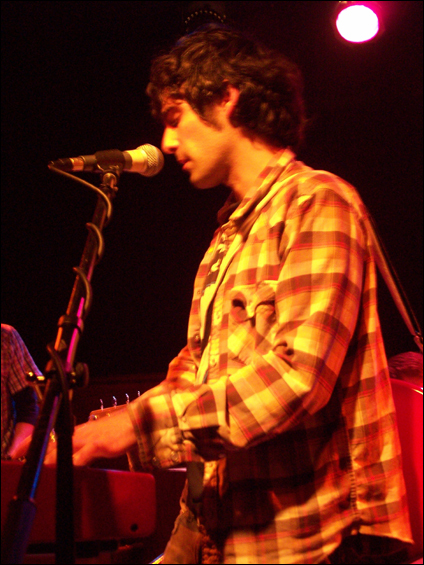 Efforts at the incredible title track of the just-released album Furr and "Black River Killer" were unabashedly great as well, and to see Earley stake his claim on the latter, saying to his band mates off-mic that he was "just feeling it," was to clearly witness and understand the strength of the songwriting this band embodies. Throughout the band's set "Country Caravan," "Summer Town," "Wild Mountain Nation" and "Futures and Folly" were all well represented, but perhaps the most telling moments was the Dolly Parton cover "The Last Thing on My Mind." 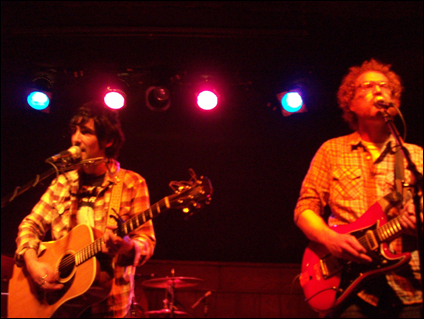 During the band's take on Parton, Earley expertly fielded shouts of "Jolene" by shrugging off the high register of the song, showing that Blitzen Trapper is more about a complete immersion in the storytelling element of song than some predetermined interpretation. Everyone in tow swayed along. See other articles by Cory Tendering.